The St. Peter’s Community Arts Academy Senior (Youth) Choir will make its sixth European tour next month from Feb. 14 through Feb. 23. 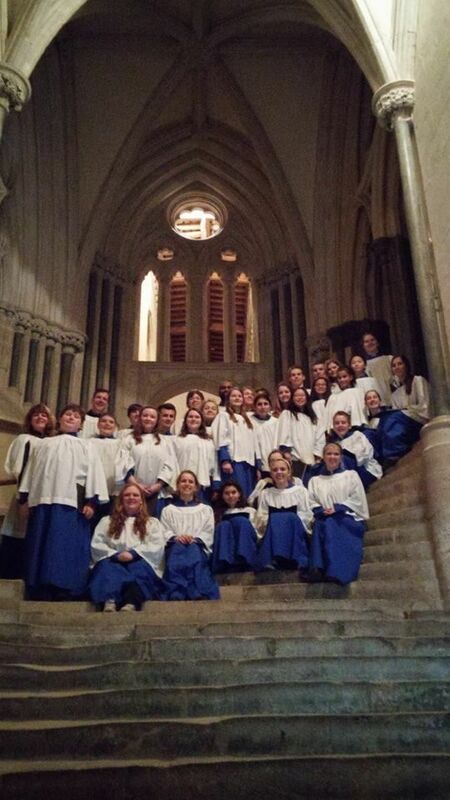 Under the direction of Wendra Trowbridge, 32 choristers ranging in age from 13 to 18 will perform a variety of programs in cathedrals and small parish churches throughout England, Wales and Scotland. When the Senior Choir, and several other choirs, were founded at the Arts Academy 32 years ago, the dream was to expose young people to the great music of the human experience and the English Choir School model going back hundreds of years, the Rev. James Adams, Head of School, explained. The dream became reality in 1999 when the first tour took place to England and the tradition has continued every four years in 2003 (England and France), 2007 (England and Scotland), 2011 (England) and 2015 (England). Locally, the Senior Choir will perform a pre-tour concert at 7:30 p.m. Saturday, Feb. 2, at St. John’s Chapel, Hobart and William Smith Colleges. The concert, which will preview the choir’s full-length program, is free and open to the public. Donations will be accepted. When on tour, the choir will perform its full-length program of sacred and secular music in Moorlinch, England, Cardiff, Wales and Edinburgh, Scotland. They also will perform in Gloucester Cathedral in Gloucester, England, Royal Chapel at Stirling Castle in Stirling, Scotland and St. Giles Cathedral in Edinburgh, Scotland. Besides performing, the choristers and the 17 adults with them will do some sightseeing at Buckingham Palace, the Tower of London, Stonehenge, Salisbury Cathedral, the Roman Baths in Bath and Stirling and Edinburgh Castles. Traveling with the choir will be accompanist Mary Ann Hamilton, percussionist Jered Slusser, Father Adams and his wife, Sue Adams, the Arts Academy administrator. Further enhancing the benefits for the choristers is the chance to stay with host families in Moorlinch. Residents of the tiny English village have welcomed the St. Peter’s Choir as host families since the first visit in 1999. When the Senior Choir was founded, Father Adams noted, the dream was to create a high level music program and share the resources of St. Peter’s with the wider community, ultimately leading to the formation of the Arts Academy offering music and dance instruction in 2005. Trowbridge, who is the community choir and voice instructor at the Arts Academy, also teaches voice at Hobart and William Smith Colleges and has taught at Ithaca College, where she received her BM and MM degrees. The Arts Academy offers lessons and performances in choirs, piano, violin, cello, organ, voice, dance and guitar for all ages and now serves more than 200 students from 16 area schools in a five-county area in large part due to the dedicated core of instructors and staff, all of whom are professionals in their field. Embracing its theme of “Arts for All,” the Academy is open to everyone from infants to adults and is not affiliated religiously although St. Peter’s Church sponsors and supports the Academy.